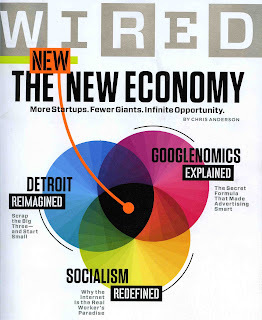 The cover of Wired's June issue has a three set Venn-Diagram. It looks nice even if it's logical relation to the main three stories are fluff. What I found exciting in the issue was the break out on the innovative way in which Google sells off advertising. Here is my attempt to condense this. For any given set of keywords, let's say like 'math', google holds an auction. All interested parties submit bids to have their add posted when someone searches for math. Who gets the first add on the search page? The highest bidder? No. Google has a quality ranking for each different add based on a number of factors. Google's idea is to keep the add material valuable to users. This is how they do it. They scale each advertiser's bid by the usefulness of the advertiser's add for someone who is searching for 'math'. How they get that quality score for each add involves a lot of data and a few company secrets. What does Google charge the companies for the adds? Not what the company bids. Instead they use the bid of the next highest ranking add, and they multiply it by the ratio of the quality scores of the two adds. The idea being that if your add is a better quality add than the second place bid, you pay proportionally less than their original bid. If it is worse, then you pay more. One interesting effect is that the 1st place add on any search page hasn't necessarily payed the most. If my description isn't working for you, check out pag 112 of the June issue of Wired. Like I said they have a really nice breakout explaining it, complete with an example.